Join us next week in San Antonio to mark this event! We will be on the Exhibit Floor at Booth 2453. Stop by to learn how Consentium Search can assist you in your critical recruiting efforts to source and hire the best Environmental, Health, Safety, Quality and Sustainability professionals. We will be in the Career Center where our EHS focused recruiters will be available to assist with resume reviews, whether you are looking for a promotion or are currently in-between jobs. 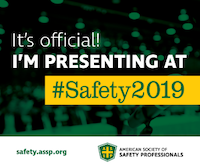 Finally, our very own Director of National Recruiting, John McBride, will be presenting “Safety Leader to Business Leader – Bridging the Gap” at Session S726 on June 6, 11:00AM-12:00 PM. Do you need a pass for the Expo Floor for you, a guest, a friend or colleague? Use the link below to receive your passes absolutely free, courtesy of Consentium Search. Free Expo Pass ($100 value) to Safety 2018, courtesy of Consentium Search LLC. Be sure to visit us on the expo floor, booth 2453. We currently have over 35 EHS Career Job Openings posted on our website http://www.consentiumsearch.com/job-search as well as confidential and other non-posted searches. John McBride, SPHR, SHRM-SCP is the Director of National Recruiting with Consentium Search, a woman-owned National Executive and Management Search Firm based out of Short Hills, NJ specializing in recruiting Safety, Environmental, Occupational Health, Risk, Human Resources and Case Management professionals. John is a self-described ‘recovering corporate executive’ having spent in excess of twenty years in roles such as Director of Human Resources and Director of Risk Management including oversight of the Safety function for 55,000 employees, He is certified as a Senior Professional in Human Resources (SPHR) and Society for Human Resource Management Senior Certified Professional (SHRM-SCP). He is an active member of the American Society of Safety Engineers (ASSE), the National Safety Council (NSC) and Society for Human Resource Management (SHRM). John has spoken both locally and nationally for ASSE, NSC, SHRM; the US Army’s “Tip of the Arrow” Ultimate Warrior Demobilization Program to ready our forces for the return to civilian jobs; and the Risk and Insurance Management Society (RIMS) on Career Development, Networking and Employee Productivity. He also volunteers with the American Diabetes Association, Habitat for Humanity and is Past President of the Society of Human Resource Management of Central New Jersey.